If by "the same quality" you mean the 128k MP3's, yes. No ETA on the lossless encodes, other than that they will take "several months" so I went ahead with what I had. Whenever the lossless versions are made available, I will replace them. If you want the higher quality, go with the Blake Robinson pack. Just wanted to say I'm quite excited to dive into the beta testing as soon as my SD2SNES arrives (should be a week or so... I will be receiving the Rev. H model so I'm really hoping to provide helpful feedback. Any chance you're willing to provide the video file for just the intro? I'd like to make sure my SD card works well in regards to the latency issues you had mentioned as video is probably my most anticipated aspect of this hack. You know, that would probably work. I can split out just the intro video easily enough. I'm about to head out of state soon, so we'll see if I have time to get it uploaded before then. Something happened with the card and the latency crashes just went away... really no idea there. It's a SanDisk 64GB UHS 1 card. Will this eventually include the extra content from the DS or is that beyond the scope of the project? Because that would be perfect, and make this like the ultimate Chrono Trigger modification. Also happen to know Dracula guy mentioned earlier, he is a cool guy. I'm surprised how small of a world people know each other around here. Sorry I never got around to writing a decent README for first-timers. I originally intended to just have people create an empty .msu file unless I gave out the full video file (i.e. for people who provided testing feedback), but I've been convinced to go ahead and upload just the intro video, and then the existing conditions still apply for receiving the full thing. Testing the new intro-only file revealed some minor logic bugs in my fallback handler, so you'll need to download the latest version of the patch (uploading as I type this), along with the new .msu file, which will need to be renamed to match your ROM file (e.g. chrono_msu_intro.msu -> chrono_msu.msu). It's going to take awhile to upload the new video file, since I'm currently running on LTE tethering, but I will update the top post with a link as soon as I have it. Ok, the intro is posted, check the top post if you're interested in trying it. I don't think you'd be able to add enough resources to add the DS content without altering events, location loading, battle, etc for two byte indexes. Yeah, I'm not really planning on adding the extra content, but it should be compatible with other hacks if people want to add it to projects like retranslations. It may require some modifications, but I'll be willing to work with anybody who wants to use it. The current msu-1 patch isn't compatible with temporal flux hacks, so as long as this one is I'll be happy. Hopefully I can just apply it right over my own work. You won't be able to just apply it over the top of another TF-edited patch, because it includes TF edits to the script, which will conflict with your changes. Once it's done, I'll split out the non-TF code and document the TF event commands to insert if you want to add videos. My code uses the ColorCrash and Special Dialog #12 events, as well as a few RAM values. I assume you'll have only used tf to edit the scripts of the areas that have videos? I haven't touched any of those maps so it should be compatible. If it doesn't I'll simply apply your patch to a clean rom and import my work into it. Yes I only edited those areas, but I'm not sure how the data relocation works in TF. My TF edits are very, very simple, so it'll be really simple to import those into another project. For each video. Eventually, I may add a video# variable instead of my current code that is hardcoded by location, but that will just be a memory assignment before the ColorCrash. World map scripts are incredibly sensitive, but I've added tons of stuff to location scripts and never had anything move so they must have lots of room in them. Well, there's definitely some stuff getting moved because I had to pick a new code location for the MSU logic. The place I was putting it originally gets overwritten when I edit the locations. Thankfully, the other 3 locations I'm using now still seem to be unaffected. Temporal Flux grabs space as needed from the list of known free space and garbage data. The first thing it tries is always 0x01FDD3, junk code in the US ROM. Any expansion of events will require moving that location's events. The Custom Data option within Temporal Flux should let you protect code from being used as free space. .The Custom Data option within Temporal Flux should let you protect code from being used as free space. Cool, definitely good to know. My code requires pretty large chunks of empty space, so being able to ensure it doesn't get overwritten would be very helpful. At this point, he has had a lot of people asking him about it, and that makes for a lot of people that he's trying to keep updated, each individually. If you're just waiting for the MSU-1 pack, I *will* be releasing that as soon as it's available, so it would be better to bug me about it rather than bugging him directly. I'll also signal boost when the FLAC files themselves are released. So, unless you have some other specific reason for wanting the FLAC files or need some kind of specific tweaks made, it would be easier if there were fewer people asking him about it. I definitely appreciate anybody who helped signal boost my original request, but if you're just waiting on the end result, do it here, alright? Hey, this puppy finally got activated. Noice. Anyway, figure I may as well chime in the goings-on personally, that way everyone's on the same page as to where I'm at on things. There're several reasons for me redoing everything--first and foremost is, Qwerty (as well as a few others, but if memory serves Qwerty was the first) asked for it. Might seem like an odd reason, but the simple fact is that I adore CT and want to see this project to its maximum, and if I can contribute to that end I'll be damned if I pass such a chance up. The second is that I really just don't like how the old ones sound. I've been going through and reworking pretty much all my past full-OST arrange albums to sound better. CT was bound to happen eventually anyway, so this project just kickstarted it happening sooner rather than later. In addition, it unfortunately happens that a large portion of the original project files have been lost--whether by a complete drive failure about a year or so ago, or by personal negligence or file corruption/deletion, I can't say for certain. What this essentially means is that these lost files will have to be rebuilt from the ground up, as opposed to simply making some alterations and adjustments to the project files still intact. If there becomes a significant gap in track progress, that's why. I don't particularly mind multiple inquiries, but the simple fact of the matter is that it's more people to keep track of and updated as to progress, and that part's a bit of a headache. Doubly so when every individual person has their own formatting preferences. I don't think I have to elaborate on the workload of mixing and formatting and looping the same sixty-five tracks in different ways several times over. So to that end, I'm essentially gonna just mime Qwerty here and kind of just lay down the law--I'll be doing this reworking exclusively for him from here out. This decision is partly due to the above level of work and scrambling to make sure everyone's kept in the loop and satisfied, but more importantly because Qwerty's been the only one that's kept in consistent and prompt contact, and I respect that level of professional courtesy (not to intend sour remarks towards any of the others, it's just that he's been the only one to get back to me punctually whereas the others often go days or more to answer--I get everyone's got their own busy lives and schedules, but so do I, and it's reaching the point where I simply don't have the free time to wait around for responses anymore, so I have to make less-than-pleasant decisions like this). Apologies if this rubs anyone the wrong way, but I've gotta do what I've gotta do with my schedule becoming what it is. 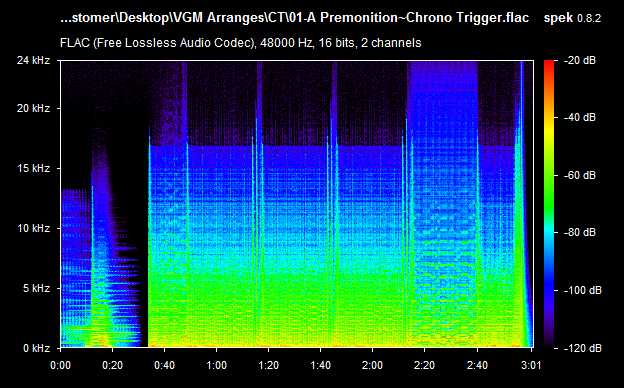 As Qwerty's mentioned and shown, everything's now a really nice-quality FLAC, each with their own sweet, sweet spectros. I'll post the progress of the album on a per-track basis here on this post, and update it when more are completed--this way, there's no doubts as to progress and wait times on my end.